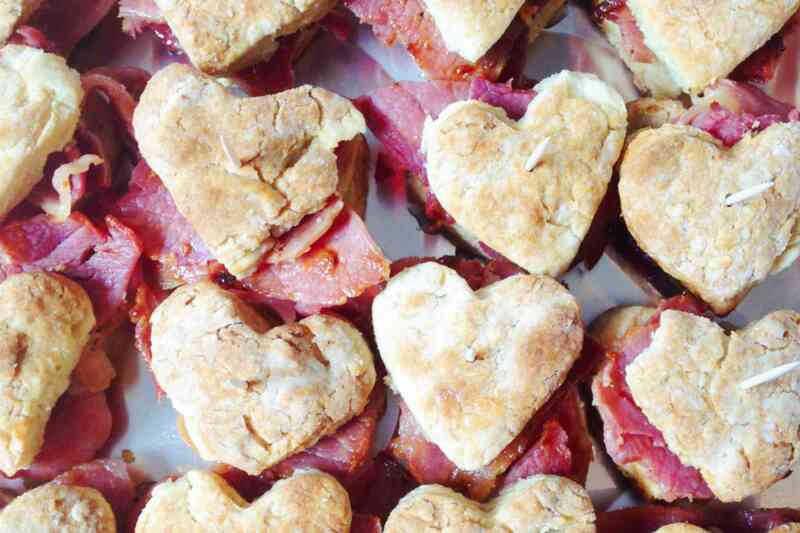 Flaky biscuits, smokey fried ham, buttery muenster cheese, and sweet honey butter make up these miniature Southern ham and cheese biscuit sandwiches. Perfect for picnics, parties, and/or feeding a hungry group of people, each bite is packed with Southern goodness. This open-faced veggie bagel sandwich is the perfect easy and crazy tasty breakfast sandwich! Half of an everything bagel is smeared with cream cheese and topped with tomatoes, cucumbers, red onions, scallions, salt, and freshly cracked pepper. It's a great way to start the day and because it's open-faced it will help prevent you from starting your day by inhaling a bunch of carbs in the morning. Just toss your bagel half in the toaster and let it crisp up in there! This creamy brie, fig jam, and pound cake grilled cheese with rosemary butter is ridiculous, it's also genius. The buttery, sweet bread crisps up so beautifully and when paired with sweet and earthy fig jam, and creamy brie, well the combo gets even more delicious. You can serve this sandwich for breakfast with a side of bacon, for dessert with powdered sugar on top, or pretty much any time you're craving a load of ​pound cake in your face. Donut grilled cheese with bacon and maple glaze is the perfect sandwich to dive into on National Donut Day! To be honest, though, this sort of delicacy is pretty perfect for any occasion! The combination of the light and airy donut against the sweet maple glaze, the smokey bacon, and the buttery muenster cheese make this sandwich totally irresistible. There's nothing quite like a fried chicken and biscuit sandwich. It's crispy, rich, comforting, and it's probably known as one of the best sandwiches that have ever existed. The fried chicken in this dish is doused with a hot honey which adds a sweet and spicy depth that is completely irresistible. And when it's all piled on top of a buttery biscuit, you'll understand why it's the perfect meal for breakfast, lunch, or dinner. Imagine this sandwich - a crunchy honey butter slathered waffle filled with crispy buttermilk fried chicken, drizzled in Sriracha maple syrup and topped with smokey bacon! It totally sounds like something out of a dream but it's real. Make this chicken and waffle sandwich a part of your dreamy morning! When you think about open-faced bagel sandwiches, lox, or smoked salmon, probably comes to mind. Now take that mental image and keep all of its deliciousness but swap out the smoked salmon for fresh slices of tomato and add everything bagel seeds to help make this open-faced sandwich even more next level. The cream cheese is great as-is, but if you're feeling a little bit more adventurous, add some chopped cucumber and fresh mint. You could even add some turkey on top for a little bit more protein. The possibilities of making are endless here! With some spicy pepper jack cheese from Tillamook Cheese, a heaping spoonful of sweet and creamy apple butter, and a buttery and perfectly flaky croissant, this apple butter and pepper jack grilled cheese encompasses the best flavor combo, sweet and spicy (and buttery). Even though this recipe recommends that you grill the sandwich, this combination is also delicious as-is - whether that's a quick breakfast, a last minute dessert, or an unconventional lunch. You can even go to the next level with this and add some salty cured meat like prosciutto or speck. Did you ever think that a handheld sausage gravy and biscuit sandwich existed? It's a beautiful and buttery breakfast sandwich that will blow all other breakfast sandwiches out of the water! This particular cheese is called Oscypek (pronounced: Ozlsg@qyhdypekek). It’s a delicious smoked cheese made of salted sheep’s milk from the Tatra Mountains region of Poland. I discovered this seductive brine-soaked, 14-day-smoked bundle of goodness last year when I visited ​Kraków, Poland. Sauteed butternut squash, crispy bacon, and melted gouda come together between two buttery toasted slices of lard bread to create a sweet and savory sandwich that highlights the beautiful flavors of fall. The bread this sandwich calls for is made with lard, so the fat content is much higher than regular store-bought bread. When we think of popular modern soul food breakfasts, chicken and waffles is probably one of the first menu items to comes to mind. This isn't surprising since it's basically the best combination that's ever existed... but when you pair this modern American classic with another classic - the grilled cheese sandwich - then you've got a combo that can't lose. Featuring crispy fried chicken, gooey melted cheese, and a sweet and spicy hot-honey blend that's then grilled between two buttery waffles, this fried chicken and waffle sandwich will change your world. Guaranteed. A grilled cheese with pork roll, tots, and Colby jack cheese is the perfect way to start your morning. The Taylor Pork Roll is a classic New Jersey breakfast staple that sort of resembles Canadian Bacon mixed with Salami. Mostly comprised of ham, this product comes fully cooked, but when pan-fried the porky richness is amplified and the caramelized meat takes on a delicious savory flavor. And when covered in melted cheese - well as you could imagine, it gets even better. Whether you're into smoked salmon, lox, or gravlax – this open-faced salmon bagel sandwich will blow your mind! Pickled red onions not only add an unexpected pop of color but they also add a nice vinegary bite that helps lighten up the smokiness of the salmon. The capers add a salty depth to the sandwich while the scallions add a nice mild onion-y bite. Pimento cheese and ham biscuit sandwiches are rich, creamy and irresistible. The pimento cheese is piled on top of a flaky buttery biscuit with a few slices of salty-sweet country fried ham, bright and flavorful pickled red onions, and earthy and vibrant bright green scallions. It's comfort food at its finest and it's bite-sized so you don't have to feel guilty! These little tea-time sandwiches are the perfect appetizer for baby showers, luncheons, or when you just really need to sit on the couch and binge eat until you're satiated. And although this recipe only makes one sandwich, it's always preferable to serve these by the dozen with a few pitchers of mimosas or bloody marys.